Besides the occasional bagel and coffee on my way to class, I almost never get food from food carts in New York, mainly because I find having nowhere to sit inconvenient, especially when it’s cold. New York food cart dishes are also pretty standard, and aside from the hotdogs, overpriced. (Why would I pay $4 for a falafel sandwich when I could go to Cheeps on St. Marks and get a $2 falafel with seating?) Trendy food trucks rarely offer dishes so exciting that I sacrifice a seat to stand on the curb for, and are usually more expensive than food carts. I recently saw a grilled cheese truck parked on campus serving $6-8 gourmet grilled cheese sandwiches. I don’t really understand why anyone would pay $6-8 for two slices of bread and cheese without anywhere to eat it, but maybe that’s just me. But NY Dosas is my one frequent exception to my street cart food embargo. Every time the weather is not too cold, I go to NY Dosas for fried Indian snacks between classes. Since the cart is stationed right in front of Washington Square Park from 11-4, there is always seating in the park to eat. Even though there is usually a line at NY Dosas for plates like uthappam, dosa, or curry, if you are just ordering appetizers, you can skip the line. All of their food is vegan but so flavorful and creative you don’t even notice. With the appetizers costing $1.75-2, and meals from $4-6, NY Dosas costs roughly the same as other food carts, and far less than gourmet food trucks. Today, I got a samosa, one of my staples from NY Dosas, and a vegan drumstick. The samosa, a deep-fried curried potato and pea dumpling, was filling, flavorful and moist yet crispy on the outside. The vegan drumstick did taste like a drumstick—I first thought it was chicken! But once I reached the “bone,” a sugar cane stick, it was clear the dish was free of meat. The umami flavor of the soy protein mixed with the mild overtone of sweetness from the slow-cooked sugar cane was completely new to my taste-buds and a perfect accompaniment to the side of cilantro chutney. 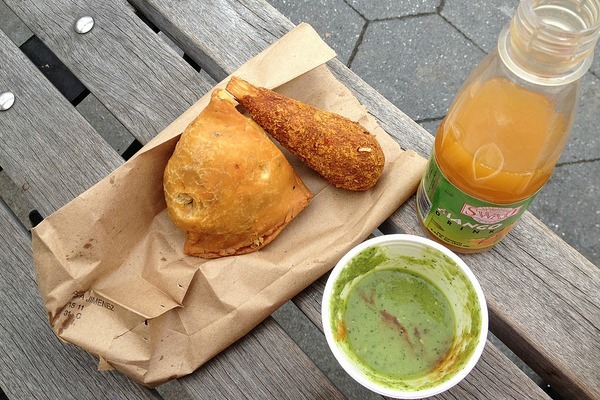 I washed the samosa and vegan drumstick down with a thick, pureed mango drink, a refreshing way to end my Indian picnic in the park before class. The combination of sweet, spicy, and umami flavors of the snacks is why NY Dosas is one of my favorite off-campus lunch spots and food carts in New York.